The Heroes’ Square of Budapest, locally referred to as Hosok tere, is one of the sights no visitor of the capital of Hungary should overlook while searching out Pest, the east side of the city. However, missing out the Heroes’ Square is highly unlikely to happen, since together with the City Park (and its inner highlights, such as the Zoological Garden, the Vajdahunyad Castle, the Vidam Park, the Szechenyi Bath and the Skating Rink), the Budapest Art Gallery and the Museum of Fine Arts, forms a pretty compact tourist attraction site. The accessibility of the square is ensured by the fact a namesake metro station is located right in front of Hosok tere, as well as by the fact the historical Andrassy utca leads from Erzsebet ter to the Heroes’ Square. Hosok tere is overtopped by the imposing Millennium Monument (Millenary Monument) guarded sideways, so to speak, by two quasi-circular arcades. The entire structure (the monument proper, the arcades, the cenotaph in front of the monument, as well as its base) is decorated with allegorical sculptural works rendering the struggle of sundry historical figures of Hungary who have actively participated to the shaping of the historical trajectory of the country. Some of the most impressive sculptures refer to the statue of Archangel Gabriel and to the seven statues at the base of the monument. 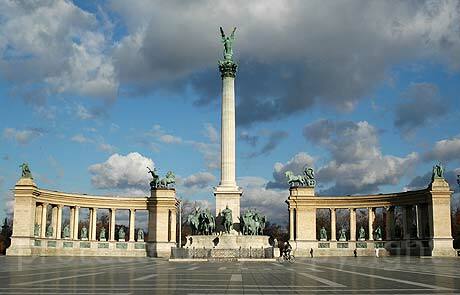 The latter represent the seven primordial Hungarian tribal leaders who brought the Hungarian people in Central Europe. Symbolically, the statue of Arpad is positioned in front of all the other six.